There is very early morning sunlight, coming from the left of the picture, which is illuminating the scene. Notice Jesus’ sleeves & hair have yellow sunlight o there edges. The yellow sunlight is also visible as a feint yellow glow in the clouds. 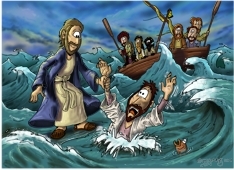 Jesus is reaching out & grabbing Simon/Peter, who is disappearing into the sea. 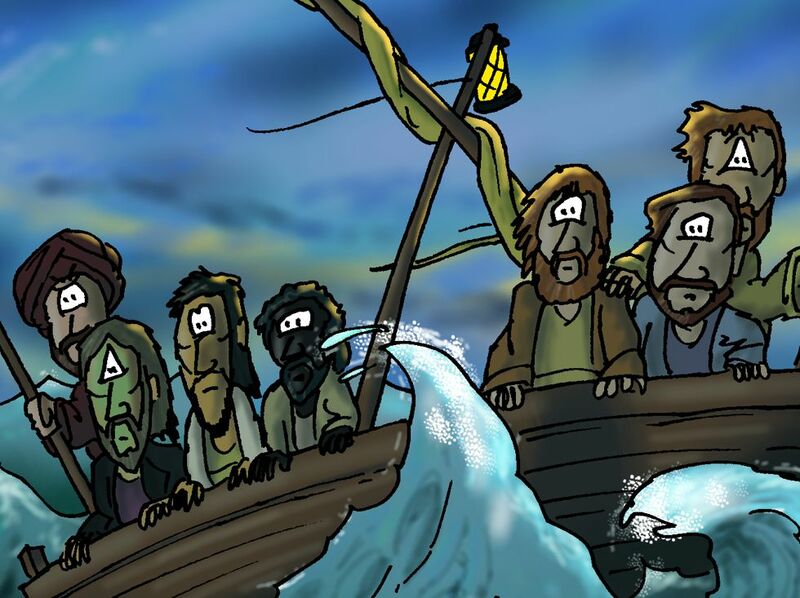 Some of Jesus’ other disciples are looking from the boat. From left to right, they are: Judas Iscariot, (holding an oar & scowling at Jesus & Simon/Peter! ), Matthew/Levi, looking green with seasickness!, Thomas/Didymus (doubting, as he is famous for!) & Philip. On the right of the boat we have John (son of Zebedee & brother of James), Andrew & James ( son of Zebedee & brother of John) who is holding another oar. This was originally the single scene which told this story, drawn in July 2010. I have now (May 2013) added the other scenes to complete the set & tell this story more fully. I like the way Jesus is standing on the water, with reflections of his robes under him. 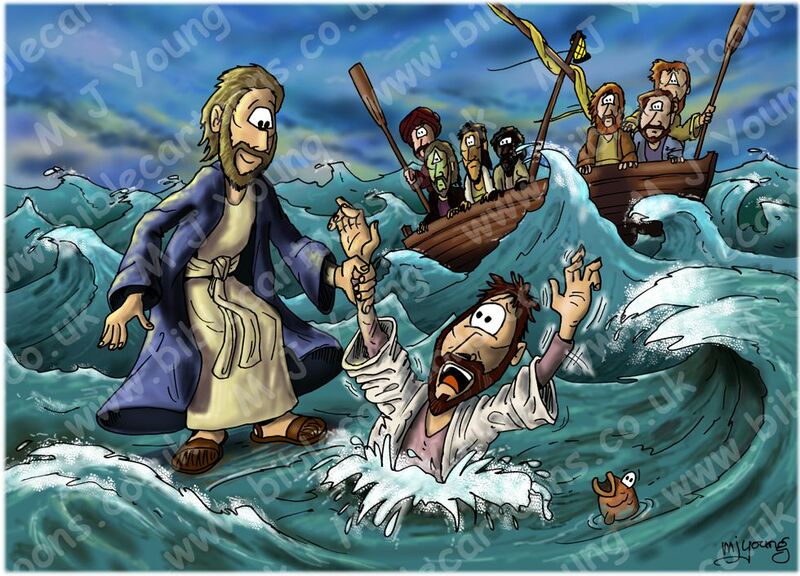 Simon/Peter is looking terrified as he sinks in the water, but Jesus’ cheerful smile will give him confidence as he grabs Simon/Peter’s wrist & stops him from sinking any further. The other disciples are looking concerned, awed, doubtful, or alarmed. Here’s a close-up of the disciple’s facial expressions. By the way, the fish is a red herring!